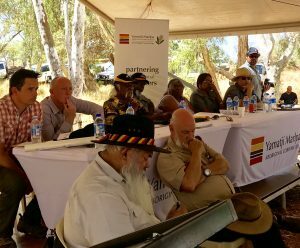 The 4th annual on-Country Bush Meeting at the Yule River meeting place was held on Wednesday 20 and Thursday 21 September 2017. 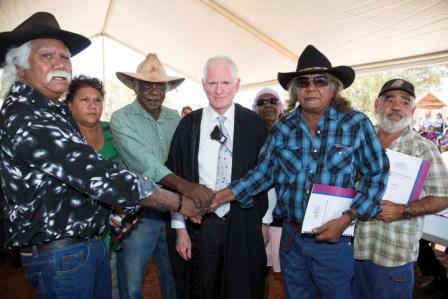 It was a great gathering of Traditional Owners, Members of Parliament (MPs) and government officials. YMAC uses the on-Country bush meeting to focus on the priority concerns of the Pilbara Aboriginal people. The Yule River meeting brings together community members to discuss legislative changes that impact them, and to gives them the chance to speak directly to Members of Parliament (MP). For some who attend, it is the first time they are given this type of opportunity. Despite the hot (40 degrees), dry, dusty conditions, over 400 people attended both meeting days. A presentation from Hon. Ben Wyatt MLA (Treasurer, Minister for Finance, and Minister for Aboriginal Affairs) was warmly received by all. Short presentations were also made by Hon. Stephen Dawson MLC (Minister for Environment; Disability Services, and Deputy Leader of the Government in the Legislative Council), Senator Patrick Dodson and Hon. Robin Chapple MLC (Member for Mining and Pastoral Region). An open Q&A session followed the presentations from the MPs, with questions and comments from the crowd focused heavily on language preservation and the poor portrayal of Aboriginal people in the media. The Annual On-Country Bush Meeting at Yule River is a forum that allows YMAC to drive outcomes from the momentum gained on the ground. We have already started planning for next year. Please save the dates: 11-12 July 2018. Local community across WA can now apply for the State Government’s 2014-15 Natural Resource Management grants of between $10,000 and $50,000 to help conserve, restore, rehabilitate and enhance landscapes or conserve biodiversity. For more information and to access application forms and guidelines please go to the State NRM Office’s website or phone (08) 9368 3168 or email snrmo@agric.wa.gov.au. Applications close on June 20. 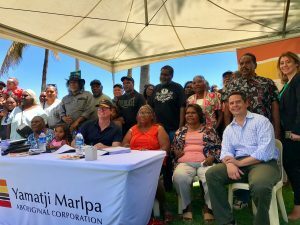 The WA State Government is seeking to fill four (4) positions that will become vacant in the coming months for the Aboriginal Lands Trust. Appointments for these positions will be for a 4 year period. The State Government is also seeking to fill six (6) position on the Australian Aboriginal Advisory Council which will become available in July. Appointments for these positions will be for 3 year period. For further information on the above roles and eligibility contact the Department of Aboriginal Affairs on 08 6551 8000 or visit their website.